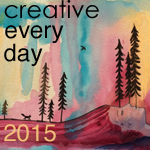 Ways to share: Once you've signed up, you can leave a comment on this post and/or use the "Mr. Linky" widåget below to link to a blog post(s) or flickr image of your creative activities during the days of 4/13/15 - 4/19/15. Theme: April's totally optional theme is Poetry! Haven’t thought yet about poetry as we’ve just returned from a road trip. Great idea, though, and will take it up soon.